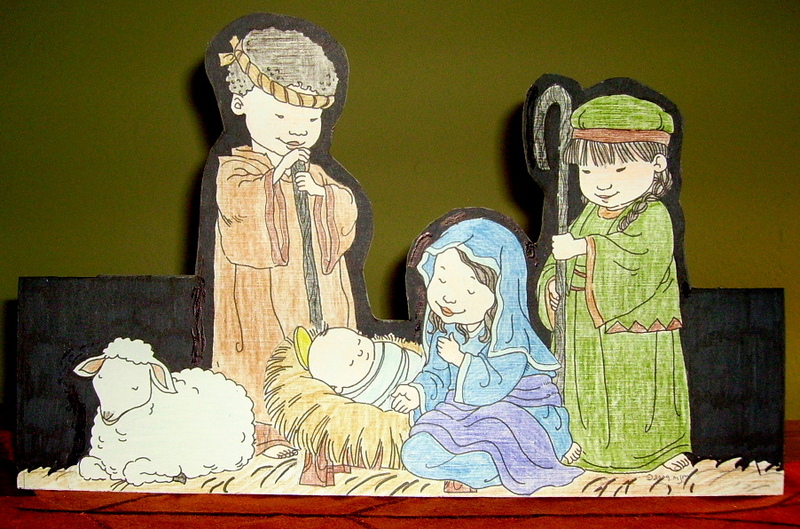 This little stand up Nativity uses one sheet of card stock. I can’t give you a pattern for the figure illustrations because they are copyright , Mo Manning. I have included a blank pattern for the stand up which will help with placing the figures. I used the Nativity stamps from http://digitalpenciltoo.com/ and sized them to Joseph (6”tall) and the shepherd (5 3/8” tall.) These are the same digital stamps as used in the projects, “Pop-up Nativity” and “Nativity Cube.” This Nativity is called “Stand Up Nativity,” and can be found in the 1st Grade Projects Gallery in the sidebar. This entry was posted in 1st Grade, Christmas Projects and tagged 1st grade, arts and crafts for kids, christmas crafts for kids, christmas nativity for kids to make, easy classroom nativity craft, mo manning figures for nativity scene, stand up nativity. Bookmark the permalink.